Within the Murray-Darling Basin, the Macquarie-Bogan catchment is regulated by two major storages – Burrendong Dam and Windamere Dam. The Macquarie-Bogan catchment is in the central-west of NSW. Elevations across the catchment range from 1,300 metres in the mountains south of Bathurst, to less than 100 metres near Brewarrina in the catchment's far north. Below Dubbo, the valley mainly comprises flat alluvial plains with elevations less than 300 metres. Macquarie-Bogan catchment is 74,800 square kilometres. The headwaters of the Macquarie River originate in the Great Dividing Range south of Bathurst, with the river flowing north-westerly until it joins the Barwon River near Brewarrina. 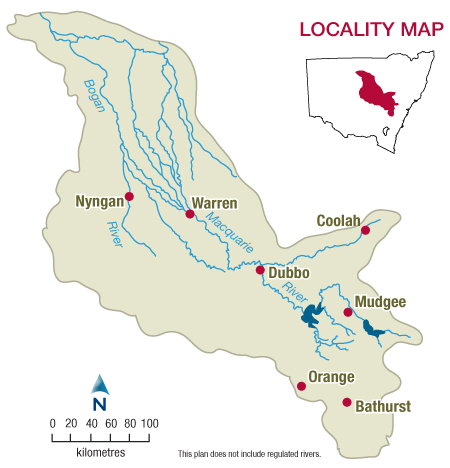 Major cities and towns relying on the rivers in the Macquarie-Bogan catchment include Bathurst, Orange and Oberon upstream of Burrendong Dam, and Dubbo, Wellington and Nyngan on the Macquarie River below Burrendong Dam. Mudgee, Peak Hill, Narromine, Warren, Lithgow, and Brewarrina also draw their water from rivers in the catchment. The Fish and Campbells Rivers join to form the Macquarie River near Bathurst, then extends north-west to the Barwon River upstream of Bourke. At Burrendong Dam the Macquarie River is joined by the Cudgegong River, which rises in the Great Dividing Range above Rylstone. Other tributaries include the Turon, Bell, Little and Talbragar Rivers. 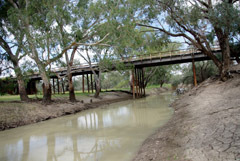 The Bogan River rises in the Harvey Ranges near Peak Hill and flows north-west through Nyngan to join the Darling River near Bourke. Near Warren, a series of effluent creeks break away from the Macquarie River, connecting with the Bogan River. View real-time data from the Macquarie-Bogan catchment on this website. Burrendong Dam, located on the Macquarie River, is the largest storage in the catchment with a capacity of 1,190,110 megalitres. It provides storage for irrigation, town water, stock and domestic use. Windemere Dam – 353,000 megalitres, provides town water, as well as water for irrigators and other water users. In addition, there are a number of smaller dams within the catchment area providing town water supplies. The Macquarie-Bogan catchment supports a range of water users including local councils, water utilities, dryland agriculture, livestock grazing and some irrigated agriculture, such as cotton. Sharing water fairly between competing water users and the environment within the extraction limits set by the Murray-Darling Basin Cap is a key water management issue. Water sharing plans seek to address this issue by setting long-term rules on how water can be accessed, used and traded. A reduction in the frequency, size and duration of flows to the Macquarie Marshes and the diversion of floodwaters within the marshes are key water management issues. The NSW Office of Water has audited floodwater diversion structures in the marshes to better understand impacts on water flows. Some structures will be rehabilitated to ensure environmental water releases and floodwaters reach key environmental assets. The Ramsar listed Macquarie Marshes are located on the Macquarie River between Warren and Carinda. When fully flooded the marsh area covers more than 150,000 hectares and is one of the most important colonial nesting waterbird breeding sites in Australia. Under the Water Management Act 2000 all water sharing plans are required to have performance indicators to assess whether the plans have been effective in meeting their objectives. The Environmental flow response and socio-economic monitoring. Macquarie Valley progress report 2009 ((PDF 2.9 MB)) summarises activities undertaken in the previous water year and provides an interim assessment of outcomes from the investigations. The department has released General Purpose Water Accounting Reports for the Macquarie-Bogan catchment providing annual consolidated and informative summaries of water resources availability and water management issues. These reports have been produced using the Australian Water Accounting Standard. The water resources and management overview for the Macquarie-Bogan catchment provides information on climate, land use, the environment, water resources, and river operations and management.